Your position when using a power saw makes a big difference in how difficult and, more importantly, how dangerous the job is. 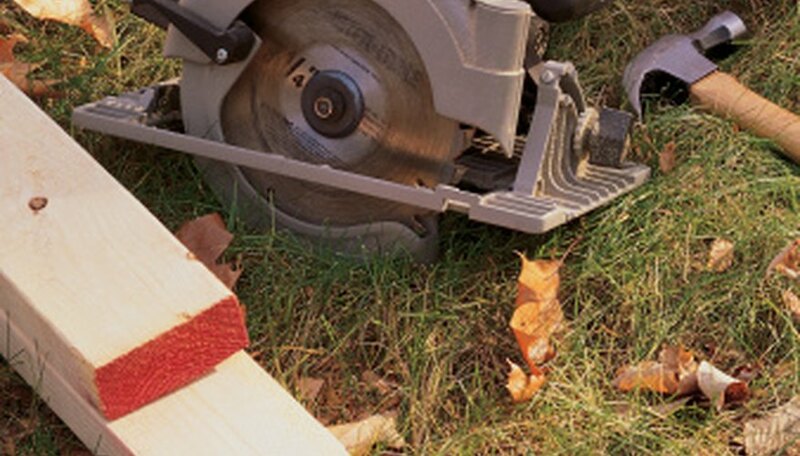 Making a vertical cut with a circular saw requires that your feet be firmly planted on a stable surface. Making a cut above your head with a power saw is inherently dangerous and should be avoided if at all possible. When working as a carpenter, it is often necessary to perform tasks in tight locations or awkward positions. Cutting the ends off joists and rafters, creating openings in existing walls and trimming plywood that has already been installed all require making vertical cuts. When this is unavoidable, do it in the safest way possible. Wear safety glasses to keep falling dust and debris out of your eyes. Be sure that your extension cord is positioned properly so you won't get snagged or inadvertently unplug your saw in mid cut. Never make a vertical cut while holding the saw with one hand. Horizontal cutting is much less strenuous and dangerous than vertical cutting. Because your saw is resting on the surface that it's cutting, your energy is only being used to push the saw forward rather than to hold it up. The saw is resting on a stable surface and is below your line of sight, so it is easier to control, easier to see what you are doing and easier to keep dust and debris out of your eyes. Carpentry is more challenging than cabinetmaking because it often involves structural work, while nearly all tasks in cabinetmaking can be done in horizontal, controlled conditions. Circular saws can save a lot of labor but are dangerous when mishandled. Always keep a sharp blade in the saw, as dull blades are more likely to kick back. Be sure that the blade guard is in working condition and snaps back quickly when the blade emerges from whatever it's cutting. Inspect the cord periodically and repair or replace it if it is showing frayed wires. If you have to do a lot of vertical cutting, invest in a lightweight saw that will cause less strain on your arms. Battery powered, cordless saws are lightweight and have no troublesome cord but don't have as much power as corded saws. Whenever possible, make cuts in pieces of plywood or lumber before it is installed in a vertical position. For cuts that would be particularly awkward if done in place, tack the piece of wood up with a couple of nails, trace the cuts that need to be made, then take it down again and make the cuts horizontally on a pair of sawhorses. This takes a bit longer but is far more safe than using a power saw under questionable conditions. What Is the Difference Between a Dovetail and a Tenon Saw?